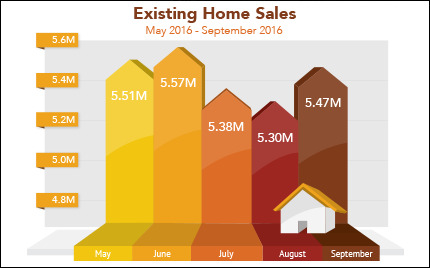 Mortgage Marketing Guide: Existing Home Sales Up! Last Week in Review: Existing Home Sales rose in September while consumer inflation remained tame. Forecast for the Week: Look for key reports from the housing sector along with the first glimpse at third quarter Gross Domestic Product. View: Dial in to the business benefits of your own YouTube channel. “I felt so good. Like anything was possible.” Tom Petty and the Heartbreakers. First-time homebuyers led the surge in Existing Home Sales as they realized the dream of homeownership in September. September Housing Starts slipped 9 percent from August to the lowest level in 18 months. While multifamily dwellings fell significantly, single-family starts, which account for the largest share of residential housing, surged 8.1 percent. Building Permits, a sign of future construction, beat expectations, rising 6.3 percent from August. Meanwhile, consumer inflation edged higher in September, though still on the tame side. From September 2015, the Consumer Price Index (CPI) was up 1.5 percent, up from the 1.1 percent annual increase in August. Core CPI, which strips out volatile food and energy, rose 2.2 percent year over year. Inflation trends are key data points to watch. The Fed‘s inflation target is 2 percent. When inflation rises, it can impact home loan rates since inflation reduces the value of fixed investments like Mortgage Bonds, and home loan rates are tied to Mortgage Bonds. For now, home loan rates remain near all-time lows. Attractive home loan rates help offset rising home prices, making homeownership or refinancing a distinct possibility for many. Gross Domestic Product (GDP) has been running well below normal this year. Friday’s reading will tell if this trend continues. Housing data will be plentiful this week with the S&P/Case-Shiller Home Price Index on Tuesday, New Home Sales on Wednesday and Pending Home Sales on Thursday. Consumer Confidence and the Consumer Sentiment Index will be released on Tuesday and Friday, respectively. Durable Goods Orders and weekly Initial Jobless Claims will be reported on Thursday. On Friday, the first look at third quarter Gross Domestic Product will be reported along with the Employment Cost Index. As you can see in the chart below, Mortgage Bonds have rebounded slightly in recent days, keeping home loan rates in historically low territory. YouTube is open to everyone to watch videos, but a Google account is required to like, subscribe, comment or create your own video channel. Once you have a Google account you can create a video channel under your personal name, business name or brand … or create more than one channel for different purposes. Video topics aren’t hard to come by because almost anything can make an engaging video: from personal branding to testimonials, to market or product updates. Even simple client “thank you” videos are a highly personal way to connect. Creating great video doesn’t require a dedicated studio space, green screen or lots of experience. All you need is a naturally lit space, some imagination and a webcam or your smartphone with the YouTube app for iPhone or Android. Once you upload your video, add a title and notes using optimized keyword and metadata, so it gets found in online searches. Also look for ways to promote your video in other electronic media, so your target audience sees it. Capture more attention from your consumers by incorporating video into your marketing efforts. These tips can help shorten the learning curve.